There’s over a five year span between the top two photos and the bottom two photos taken today. And so much is different. 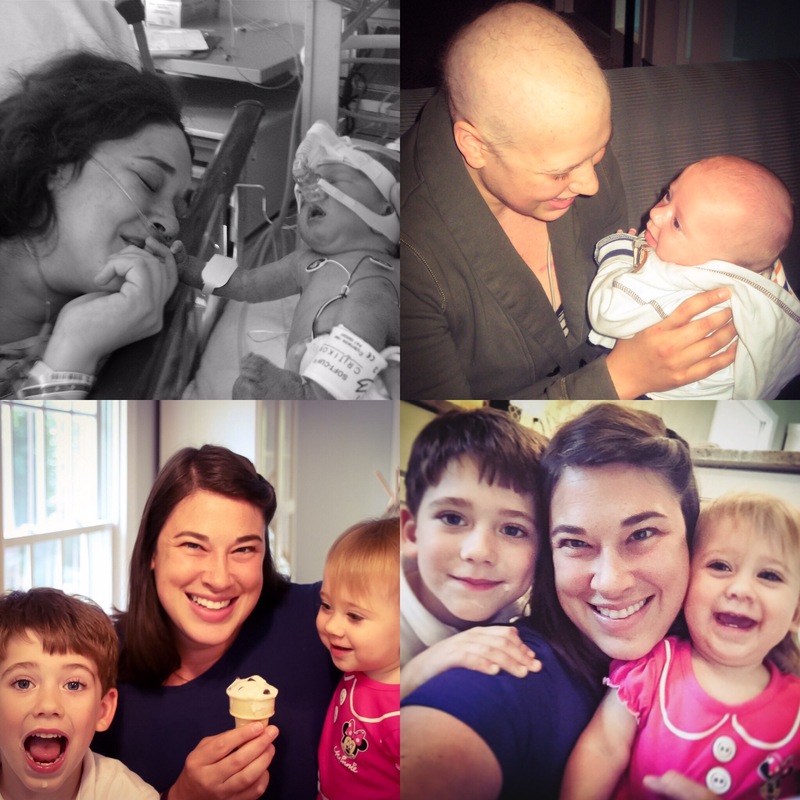 The first photo was taken just two weeks after I was diagnosed with cancer, and just moments after I’d met my son for the first time (though he’d been in the NICU for hours already.) The next picture was taken at the time I was likely most in danger of not making it (other than when I was diagnosed at stage three and with a collapsed lung…while pregnant.) In that photo, I was in the hospital, extremely sick after several rounds of chemo, my body unable to fight off an infection, and in great need of several transfusions. Obviously, a baby couldn’t be in that situation, so we were only able to have a short visit for 15 minutes once I had made it through the worst. So much is different in these photos, and yet, one thing is the same: in each photo there is joy. Whether I was in a terrible situation I would never wish upon another person, or as I celebrate being in a position I know so many people with cancer and other illnesses would do anything to experience, there is visible joy. I actually didn’t recognize how much joy still permeated my life when those dark days were upon me, but now, with distance and perspective, and in evidence such as these photos, I can see that it was always there. And it’s certainly NOT because of anything I did that was special or amazing; on the contrary, there were so many times when I was so overcome by negative emotions that I nearly sucked all the joy out of my life. And yet, it remained. I’ve heard the popular saying, “Choose Joy,” but to be honest, I’m not sure that it’s as simple as that. For I know there have been several times in my life when choosing joy on my own seemed impossible, particularly when I was fighting depression a few years after treatment. Still, even then, despite my best efforts, there remained a steadfast joy in my life that kept me from reaching the depths of despair. And I want to tell you where I KNOW it came from. Over five years ago, one February night, Mike and I were lying in my hospital bed in the dark. I had been diagnosed with Non-Hodgkin’s Lymphoma two weeks earlier, and had been in the hospital ever since. Earlier that day, it had become clear that although our medical care was incredible, there were no easy or clear answers of how to proceed. The NICU doctors wanted our unborn son to have more time to mature in the womb, but the oncologists said we couldn’t wait to do treatment any longer, and the treatment they wanted to do could not be done until my son was born. And so, after much discussion, a c-section was planned for the next morning. As I lie there with Mike, everything hit me at once, and I cried for hours. I was inconsolable and felt nearly hopeless. And so, my faithful, strong husband did what he had always done when I was distressed, even before I believed in God: he began to pray. After he said a few Hail Marys on his own, I joined him, and suddenly, I felt compelled to say a prayer I never had before. “Come, Holy Spirit” I said, over and over, crying, clinging to Mike’s hand. He joined me. And suddenly, there was a flash of light. It appeared just above our legs, suddenly, and lasted mere seconds. I stopped praying, but said nothing, assuring myself I had either imagined it or that there was some explanation…some kind of exterior light that had to have caused it. Mike jumped up, and began opening the blinds on the windows of the 12th floor we were on, as well as pulling back the shade on the door to the hallway. He tested the lights, turning them on and off. He paced the room, and then finally sat back down on the edge of the bed. “Did you see a flash of light? Just over the bed?” I asked him. “Could it have been…I don’t know know…something else, I mean, a light from the window, maybe?” I asked. It was a moment when I should have had so many questions. Perhaps I should have felt more confused and scared. But all I felt was peace wash over me, in a way it never had before. I felt incredibly drowsy, like all my worry and anxiety had been lifted and I could finally rest. I felt a peace that surpasses all understanding — for it didn’t come from a sense that John Paul and I would survive the delivery or the NICU stay that surely awaited him and the treatment that surely awaited me. It came from a feeling of trust I’d never had before: a trust in God’s goodness, despite this horrible situation, and a trust in His love, despite my pain and suffering. And above all, I trusted that He was with us, not metaphorically, but literally with us, and that He would remain with us until the end, whatever that looked like. Through all of this, I felt complete peace. Even as they strapped my arms down and placed the arterial line I had been dreading, even as six or seven nurses and doctors milled around me, and even as I was put under, not knowing when and if I’d see my sweet John Paul alive. It was all peace, and it was all joy, because I believed completely for the first time that whether I lived or died, God held me, and that He was still good. I can never put myself in the position of a mother who has faced certain death and must leave her child behind, or a mother who knows the intense grief of losing her child. I would never pretend to know what I would do or think in those situations. I don’t know what my future holds, nor do any of us. But I hope and pray that the steadfast joy and peace I found in giving all control and worry up to God would carry me through anything, just as I was carried through the ups and downs of the past five years. And the whole reason I am finally sharing this story — even if it makes me sound crazy and out of touch to some people — is that I so fervently hope and pray that no matter your current beliefs, past experiences, or obstacles in life, you consider letting God give you the peace and joy He so longs to give you if you only relinquish your control and say, “Let your will be done.” May you trust in His goodness and love and steadfast devotion to all of us, every single one of us. Oh, Ali, I am so thrilled to see your blog active again. I love you so much and am so proud of you. Please keep writing (and encouraging me to do the same!) The world needs your words of hope. Thank you!! I’ve missed writing. Hopefully I’ll be able to get on here more as it’s always been so good for me to reflect. Love you so much!! Thank you for being one of my biggest supports always. Thank you for sharing your faith and your beautiful story so generously with everyone around you. Congratulations on this wonderful news! Thank you my dear Elise!!! Love you. Come Holy Spirit! Truer words have not been prayed. May God continue to bless you and your family, and may you continue to share your beautiful and inspiring faith with all you meet. We need more happy stories like this one in our world! Father Dan! Mike and I wanted to share this story with you for a long time, truthfully, because you were so important in our journey. I always remembered that you prayed that prayer…maybe that’s why I thought to do so that very night! Thank you for everything you’ve done for my family and me. We are so grateful for you!! I’m so happy that you resumed your wonderful blog. I’m sure your story will encourage many others in their faith, with their struggles, and in their appreciation of life. Love you, and always so proud to be your mom. Love you too, Mom. I’m grateful beyond words for all you’ve done for me. Judy, thank you so much for your very sweet words. I’m so grateful to know you and your wonderful family, too. We really do love you all so much, even though we don’t get to see one another as much as we’d like!! Many prayers for you all, and much love. Amazing grace … flows through you abundantly. Thank you! Oh Debbie, thank you for always being so supportive of me and my sharing on here. I am very grateful for you!! Thank you so very much, Carolyn!! Prayed for you and your family! Thank you so much, Leah. So glad to have met you!! Love and prayers to you, too.